What are the required clearance distances around a heating furnace: here we provide a table of recommended working space and fire clearances for gas fired heating furnaces. This article series answers just about any question about forced air or warm air furnace central heating system troubleshooting, inspection, diagnosis, and repairs in residential buildings and homes. Clearance from combustibles - ranging from 0" to 18" to 36" (typically) depending on the fuel type (electric, gas, oil). Working space or clearance distances - that may allow 0 on 1-3 sides but always requires working space at least at the front, or at front + rear if access to a blower or filter are at the unit rear side. 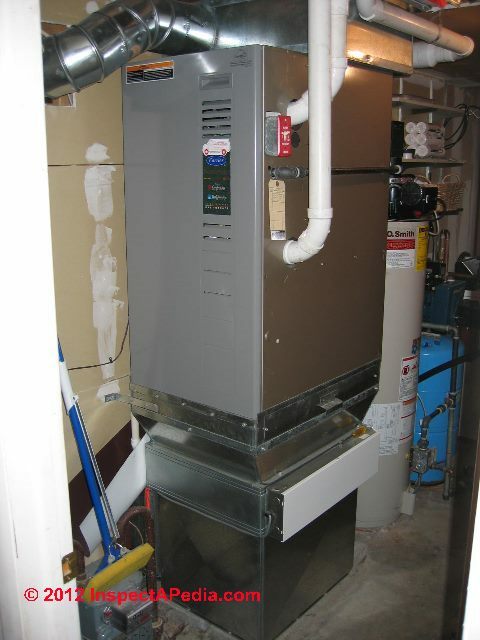 Typically for gas furnaces there must be a minimum of 24" front accessibility to the furnace, and any access door or panel must have enough clearance space to permit removal of the largest component in the equipment. Direct vent terminal clearance distances: distance from the exhaust vent at the exterior wall to building features such as gas meter outlet, windows, doors, balconies, building corners, clearance over a driveway or paved sidwewalk. Chimney clearances: for heaters vented into a metal or masonry chimney, clearance distances around the chimney and chimney top including chimney top to roof. Location related clearances: for heaters installed in a garage or in another location subject to hazards of gas accumulation at floor level or subject to impact by a vehicle, protection and elevation above the floor are required. Flue, condensing furnace, plastic vent 0" Notes 1, 10. 6. Attic installations: A horizontal gas furnace installation in an attic should be on a service platform large enough to allow for proper clearances on all sides and service access to the front of the furnace (see manufacturer's I&O manual). Line contact is only permissible between lines formed by intersections of the top and two sides of the furnace casing and building joists, studs, or framing. 7. Attic instllations, suspended: The horizontal furnace may also be suspended from the joists using 3/8" all-thread rods with pieces of angle iron underneath the furnace to form a hanging rack at both ends and the midpoint. The rods need to be of sufficient length to allow for proper clearances from combustible materials. The angle iron needs to be at least 32" in length to allow for access to service panels. 8. Crawl space installations: The furnace may be placed horizontally in a crawl space on a pad or other noncombustible material which will raise the unit for sufficient protection from moisture. 9. Condensate drain elevation space: A horizontal furnace in a crawl space must also be elevated approximately 4-6 inches to allow clearance for the condensate drain to exit the cabinet in the horizontal position. 10. Condensing furnace venting: American Gas Association has certified the design of condensing furnaces for a minimum of 0" clearance from combustible materials with a single wall plastic vent pipe. See DIRECT VENTS / SIDE WALL VENTS for a complete table of recommended clearance distances from a direct vent gas appliance terminal to other building components or features. 11. Masonry flue or shared flue venting: Where the system is routed to the outdoors through an existing masonry chimney containing flue products from another gas appliance, or where required by local codes, then 3" venting of Type 29-4C stainless steel must be used in place of PVC material. These furnaces have been classified as CATEGORY IV furnaces in accordance with the latest edition of ANSI Z21.47 • CAN/CGA- 2.3 Standards. Category IV furnaces operate with positive vent pressure and with a vent gas temperature less than 140° F above the dewpoint. These conditions require special venting systems, which must be gas tight and water tight. So where is the issue with clothes dryer distance to the gas furnace? 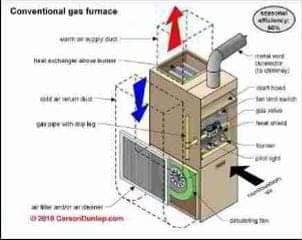 The answer is working space or fire clearances from combustibles that will be specified in the gas furnace installation manual for your specific heater. If the dryer is installed too close to the heater it violates the manufacturer's instructions, may prevent proper heater maintenance, and might be unsafe. Using an American Standard Gas Furnace installation manual as an example, since you don't name your furnace brand and model, the word "clearance" appears 50 times in the document, showing that the manufacturer indeed has a worry about safe clearance distances for the heater. Continue reading at FURNACES, HEATING - home, or select a topic from closely-related articles below, or see our complete INDEX to RELATED ARTICLES below. 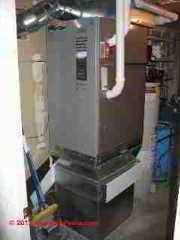 FURNACE CLEARANCE DISTANCES at InspectApedia.com - online encyclopedia of building & environmental inspection, testing, diagnosis, repair, & problem prevention advice.